I went into MTM concerned about this project for a variety of reasons and hence had very low expectations. I arrived at the theater 6 minutes before the movie started in a very populated LDS area where I assumed there would be the best turn out. I went on Saturday night of opening weekend. There were no lines and I was surprised the theater was only half full, despite all the advertising and at least two apostolic requests to all LDS members to watch the movie opening weekend. Perhaps other locations saw better attendance. If my experience is anything like other areas, then this movie is not likely to be a blockbuster nor is it likely to make much money. I read an article in the Salt Lake Tribune where the author comments: “The film is more of a showcase of Mormon wholesomeness than a candid look at the real us. While it’s nice to have my people portrayed as so blissfully positive, I came away wondering if I had been raised in a completely different church” (See article here). I could see how some may not view this film as totally accurate. 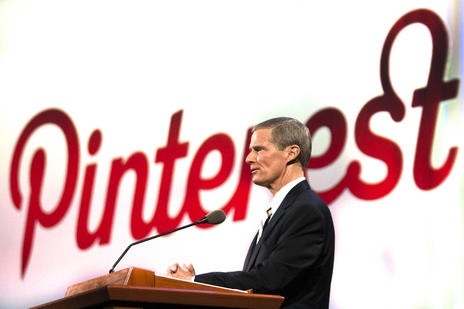 The church is encouraging members to use social media channels such as Pinterest to promote the gospel. I’ll be candid, I was very underwhelmed by the movie itself. It was dry, slow, non-climactic, and really quite bland. I was surprised that the film was only an hour and eighteen minutes long. Its length was much shorter than I expected. Most movies are at least an hour and a half or more in length. I’m not saying longer would have been better, I was just surprised at how short it was. The coverage of these 6 people was very shallow, with very minimal real details of their lives or their faith. “Mormons believe in God and Jesus and families and the Bible and an interesting book called the Book of Mormon” was the general idea. As I sat there amongst a mostly LDS audience, I wondered if any of them would have attended a movie that was called “Meet the Jehovah Witnesses, or Catholics or Amish.” I kind of doubt it, unless the reviews of course were off the charts. One movie review on Rotten Tomatoes said, “Would you go out of your way to see an infomercial that was more than an hour long? Would you even pay for the privilege? 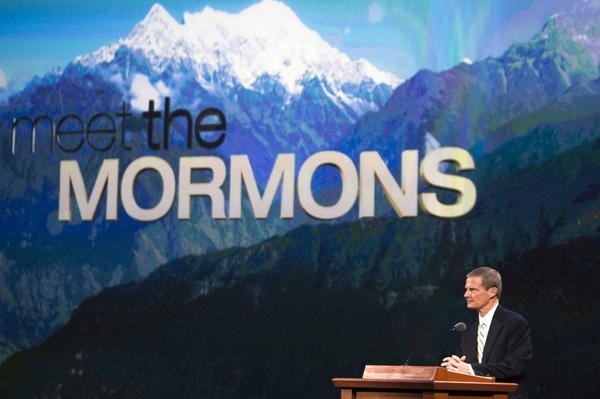 That’s what ‘Meet the Mormons’ would have filmgoers do” (See here, and here). Many other reviews from news outlets were equally disappointed in MTM (see Nearing Kolob for other questions and links). In all candor, this movie seems out of place being in the theaters. The quality and story line were simply not there. I think the Legacy theater would have been a better fit, although I think The Testaments and Joseph Smith movies are much more powerful. In fact, I wonder if the Testaments would have not been a better hit in the theaters, despite its obvious attempt to share our message. After seeing MTM, and after contemplating the project more generally, I think focusing on our core doctrinal message would be a better use of our time and resources. Focusing on highlighting people in a time of such great urgency, may be a luxury we cannot afford. Meet the Mormons to date has grossed $5.8M. Reviews from movie critics is averaging about a 5-10% like rating vs. a 90-95% dislike rating. Interestingly, according to Rotten Tomatoes, 91% of all viewers have liked the movie. This translates as many if not most or all movie goers likely to be LDS. This entry was posted in Main and tagged Image of the Church, Meet the Mormons, peculiar people, vanity on October 17, 2014 by Bishop Anon. As of today Friday 17 Oct 2014 MTM has grossed $3.7 million. I suspect over this weekend it can garner another 1.7 million or so. Numbers like these indicate when alls said and done in 3 weeks or so it ought to gross 7 million. There shall be a very good monetary return on the church’s investment. Just for fun and comparison, another sort-of-Mormon favorite was Napoleon Dynamite. Napoleon’s budget was $400,000 – it grossed $46 million dollars (Wikipedia). I going to suppose that the production of MTM was less than Napoleon. I’ll just say $350,000 (it is a normal practice to publish the costs of a movie, there has been no numbers thrown about by the church yet on MTM.) Of course all the saints in the movie were voluntold to participate (candy bomber was a fantastic story all over UT news last year) ergo there were no costs incurred for talent. The church’s companies own outright all of the production infrastructure. It has on salary the personnel to put the movie together. Kurt Bestor is not that famous outside UT for his music – can’t imagine he charged the church half a million for the score. What I am suggesting is that the entire road show cost the church a few hundred thousand dollars at the most. I’m also then guessing that the church has already made up all of its investment and will probably make a huge profit (percentage-wise) from MTM in the end. Can’t imagine the scandal and jeers amongst the anti/exmormon forums in the event the church was to keep its profits and roll them into a sequel or reinvest in a mall in Provo. You know the exmormon community decries the church’s abysmal percentage of cash it gives to national non-LDS related charitable causes, which is not an inaccurate criticism. When the church hands off a check for a few million dollars to the Red Cross from the earnings of MTM, the church will win yet again in its publicity campaign. And the haters will be silenced for a hot second – the corporate church would have capitulated to the criticisms regarding its lack of giving juxtaposed with its inordinate spending on commercial enterprises. And the name of the Church of Jesus Christ will once again go forth boldly, nobly and independently across the titles of Internet news outlets like the Huffington Post. One observation that virulent exmormons have about the church is that it is GENIUS at marketing. MTM like it or not is the absolute perfect marketing and public relations activity running in tandem with the church’s explosive social media campaign. This is the “Mormon Moment 2.0” though this one is driven by the church not on accident like the last one. Funny thing is that it was church members in the end whose tithing dollars funded the movie, and it was their “walkin-around money” that brought in the gross receipts. Church gets a cute movie for a little while, and magnanimously gives a few million to the American Red Cross. It’s absolutely genius. The real issue is about the integrity of the Church’s campaign. As has been pointed out before, what percentage of the ward that you attend is represented by the types of people in the film? The other problem is that it’s just another way to milk it’s members for money. I bet less than 5 percent of the money earned came from non members. Would you be willing to say that this movie is an accurate representation of the type of people that one would encounter if he attended a local Mormon church? It’s like getting an investigator to read the book of mormon and then asking him to pray about the Church being true. One could easily show that if the book of mormon is true, then the current lds church is not true. The book of mormon doesn’t represent what the Church believes. As a matter of fact the book of Mormon contradicts much of what the Church believes. For example read 3 Nephi Ch 11. This is where the resurrected Christ first appears to the Nephites. Christ specifically declares what His doctrine is, and then gives a warning to any who would add to or take away from that. Do you notice anything in what He declares as His doctrine that would imply a Temple, or an earthly priesthood authority is needed? Faith, Repentance, and Baptism is all that is preached in the book of Mormon. Consider the story of Alma Senior. He was one of evil King Noah’s false priests. He hears Abinadi preach that Jesus is “God himself” and other ideas that make the most sense if you accept that Abinadi was a Trinitarian. Alma’s heart is pricked, and he begins teaching in the wilderness, and baptizes himself and then a whole bunch of people. He then leads his people to Zarahemla where he establishes churches that are only loosely associated with each other. These various churches were collectively “the church of God” not because they were established by the priesthood authority–something that was never conferred upon Alma–but rather because “there was nothing preached in all the churches except it were repentance and faith in God.” This is the first mention of a church being established in the Book of Mormon, and it doesn’t happen until 480 years after Lehi left Jerusalem. They preached Trinitarian ideas, and the church was established without priesthood authority (Mosiah 17-25). There was no Levitical priesthood in the book of Mormon. You cannot find mention of the Aaronic priesthood anywhere in the book of Mormon. Take a look at your gospel principles manual under the chapters dealing with priesthood. Notice how many times the book of mormon is referenced. Maybe once. There is a good reason for that. The priesthood concepts in the book of mormon are completely different than what the LDS Church teaches today. Your comments are, I hate to say, absolutely right on. Sounds like the great Book of Mormon giveaway in the 60’s (or 50’s) where tithing was used to print and publish copies of the books, which then had to be bought by the wards to give away to members’ friends. You pay tithing for the book to be published, then buy it again! too bad no one actually reads the book. Rather, it has become relegated to second fiddle to the KJV Bible, which ironically Nephi said was the corrupt book of the Great and Abominable Church used to put into captivity those souls who rely on it for light and knowledge. The Bible should only be used where it in concordance with the Book of Mormon…not the other way around! ! No wonder we are a condemned people. I pray we all wake up to the miracle that is the Book of Mormon, and go ‘out of captivity’ as Nephi would say. Daymon Smith’s ‘A cultural history of the Book of Mormon’ put into words exactly what I have always felt. His is the greatest work since the Book of Mormon itself, in my opinion, as he relies only on the text of that Book itself, rather than interpreting it through the eyes of the KJV Bible. Anonymous bishop, please keep up your fantastic blog. The LDS in no way shape or form place the KJV of the Bible ahead of the Book of Mormon. You can’t find Mormonism in the Bible anymore than you can find Mormonism in the Book of Mormon. They place modern day revelation above the B.O.M. If you indeed hold to the B.O.M. being true then you will have a rough time claiming that the KJV of the Bible has been corrupted. The early edition of the KJV is quoted word for word throughout the B.O.M. The B.O.M. even contains translation errors that are known to be specific to the KJV of the Bible. These errors don’t affect the meaning of the text, but none the less they are not in any of the ancient manuscripts. Which is why they show up in italics in the KJV. The translators added them to smooth out the text. These words are not contained in any other translation of the bible to include the version that the LDS church uses now. Early on one of the things that Joseph claimed was the purpose of the B.O.M. was to testify to the truthfulness of the Bible. He claimed it contained the fullness of the Gospel the same as the Bible did. It wasn’t until his doctrine started to evolve that he began to claim the Bible had been corrupted. There is nothing that the book of mormon teaches about salvation, that isn’t in the Bible. It teaches Faith, repentance and Baptism. The book of mormon actual has some verses that teach the trinity very clearly. If you look to the B.O.M. by itself for what it teaches about God, you will see it teaches that there is only One God. That he is uncreated and from everlasting to everlasting. That He has eternally existed. That Jesus is both the son and the very Eternal Father. All this business about Jesus being Jehovah and God the Father being Elohim isn’t even in the standard works. That along with the doctrine on the Holy ghost wasn’t even official until 1916. Anyway consider this. We have thousands of ancient manuscripts written in Greek and Hebrew that were spread all over the world during the early years of the Christian church. We can examine these today and see the amazing fact that they are nearly identical. We don’t even have a single writing written by anyone from the book of mormon that we can examine. Not even one. How likely do you think that is if indeed the book of mormon people truly existed? In my small town the church wards are paying for the tickets so people will go and see the movie. I opted out. I can stay home and watch I’m A Mormon commercials on youtube for free. They said the movie is not a proselytizing effort. Maybe it is really a test to see how faithful mormons will be to the call from the 15 to do as they commanded. Since many members didnt heed, we will probably be punished with more forceful follow the prophet propaganda to refine our programming until we say “how high?” when asked to jump. be that as it may, as David Whitmer pointed out- we are so eager to believe a collection of testimonies from a bunch of dead ( and supposedly real) people who lived way beyond any of our lives 1800+ yrs ago. Yet we have a problem with three LIVING witnesses who gave their testimony of what they saw and heard, and though they came to oppose Joseph even hating the man at some point, their solemn testimony remained til their deathbeds. Paul (who was a thorn in the side of Jesus’ 12) who never had anyone witnessing what he did simultaneously wasnt at the transfigration- many refer to him as an inside Roman job. How do we know any of the Bible is true? I’ll use your words- if it is in the BoM them I’ll believe those parts. The KJV parts are mainly Isaiah. ..Jesus confirms Isaiah is important in the BOM. The Catholics used this book to enslave millions and torture the saints…Nephi called it corrupt for a reason. It is NOT the Book of the Lamb. D&C 93 (I think) says the Book of the Lamb will proceed forth from a Jew from John…the real Bible which the abominable church corrupted. I’d love to see where Joseph stated the BoM was to convince the Bible wad true…could u post a link? Wonder why he was asked to translate the Bible then? And what was the corrupt book the gentiles carried over the many waters?? I am happy to be wrong as it means I have learned something. My apologies in advance if I seem firm in this position but I dont mean it like that. ..I’m thirsting for knowledge too! Here’s a non-mormon look confirming the validity of the Bible. kerp in mind the unlike the BoM which is an abriged book which is self contained chronologically, the Bible is a collection of books that are not linked together as one but just bound together. It is not ‘a’ book but ‘a collection of many books chosen by and presented to the world by the great abominable church, sans any witnesses or surviving original documents circa the time the apostles were actually alive.’ (My definition, on the fly). I think it is time to awake to the coming forth of the real Bible, the Book of the Lamb from John himself. Early on Sunday morning after the release of MTM, I was surfing ksl.com and saw an article with a headline that MTM was #1 in box office. It went on to say it was #1 in cities like NYC, DC, and Detroit. I thought to myself, really?? I then spent a few minutes looking at box office websites and found it was listed as 11 at the best. When I returned to ksl.com to reread the article, the story had been removed. 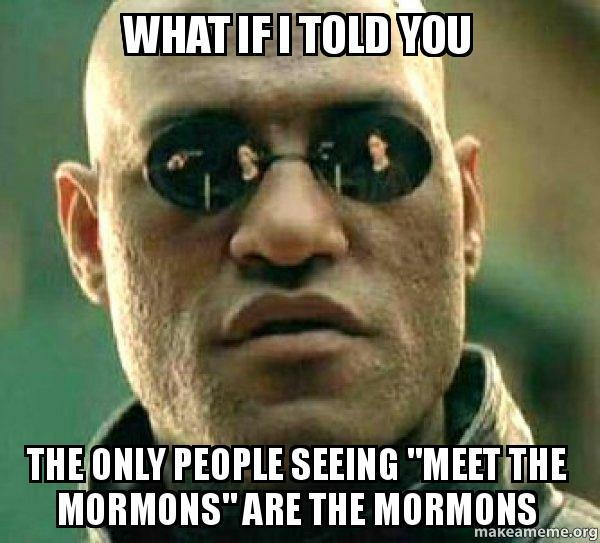 I don’t know if “Meet the Mormons” had legs that kept it playing in theaters along the Wasatch Front, but here in the Sacramento area it sank like a stone in its second week, with no trace of it whatsoever thereafter. Exactly! In some ways I would’ve felt better I think, if they had simply “churned” our tithing dollars right back into the church. BUT to give them away to the Red Cross just feels weird and your link confirms the issue at a much deeper level. It’s really been interesting to watch the spin from Deseret News suggesting MTM is somehow breaking records for “documentaries” in the theaters. A) I did not realize it was a documentary – others more astute than myself are calling it an infomercial. B) I guess documentaries don’t traditionally get a lot of traction in the theaters and hence the reason we see them go directly to Neltflix. Recent revenue numbers are saying this movie has brought in $5M. I’ve heard that wards are being encouraged to attend en masse for family nights. One ward I know of did a tailgate party at the theater, lol! Not sure us Mormons know how to do this sort of thing. Maybe we should have tailgate parties at church and see if it increases our Sunday attendance. Or rent a bouncy house and give away free fat boys. Or better yet, actually watch the Superbowl as a ward instead of intentionally scheduling meetings at the exact same time the game starts. Just to give you a sample comparison by titles, Meet the Parents grossed about $200M, Meet the Fockers – $300M, and Meet the Spartans, which was a total bomb in the theaters, did about $50M. We are at $5M – which I’ll be honest, is a lot more than I thought we’d make. But when you consider that likely all the members to have watched this movie are LDS then I think we have to ask ourselves, “To what end?” I’d like to see the accounting. If we are breaking records right and left, then the church should be excited to show us how little MTM cost to make. Thanks for your comment Rock. Ha! This is very funny! Don’t forget to ask what color.